The Brooklands Parts Department stocks an extensive range of new, used, and new, old stock parts. In addition, we work with 100 parts suppliers worldwide. If you are looking for parts, you have come to the right place! As Moss Motors authorized distributor, we can offer discounts on quantity orders. We install what we sell, so if you are having fitting problems please contact us. 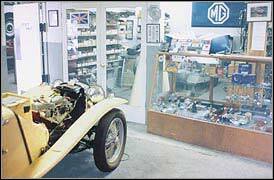 We will be happy to personally assist you with parts for your fine British automobile. We accept cash (US dollars), checks, money orders (US Postal, International), PayPal, and credit cards (VISA, MasterCard, AMEX). We ship daily UPS Worldwide or Parcel Post. Order today! Call (253) 584-2033 (USA) or send us an email.